The Hyundai Sonata Hybrid is a gas-electric version the popular four-door sedan. 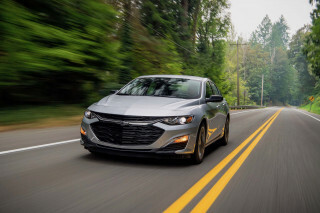 It competes with other similarly electrified versions of mainstream sedans such as the Chevrolet Malibu, Ford Fusion, Toyota Camry, Honda Accord, and Kia Optima. When it arrived in 2011, the Hybrid version of Hyundai's swoopy, sixth-generation Sonata was the brand's first U.S.-sold hybrid. It was updated for the 2016 model year with the newest generation of the Sonata, launched in gasoline-only form the previous year. In 2018, the Sonata Hybrid adopted styling from the newest Sonata sedan. A Hyundai Sonata Plug-In Hybrid was introduced, with extended all-electric operation that takes on the Ford Fusion Energi plug-in hybrid and possibly both the Chevy Volt and the Toyota Prius Prime as well. The Sonata Hybrid carried over with no mechanical changes for 2019. In the new version of the Hyundai Sonata Hybrid that was introduced for 2016, Hyundai adopted its latest body style and made slight improvements to motor power and battery capacity as well as major improvements to its control software for clutching the gasoline engine in and out. 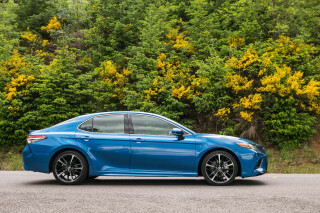 The gasoline engine changed, too, from a 2.4-liter inline-4 in earlier models to a 2.0-liter inline-4 with direct injection and a long list of efficiency improvements. Fuel economy ratings were up—as high as 40 mpg city, 44 highway. For their hybrid models Hyundai moved the battery under the cargo floor to facilitate flat rear seatback folding. Hyundai introduced a new 2016 Sonata Plug-In Hybrid that offered a much larger 9.8-kwh battery pack, a somewhat stronger motor system, and 27 miles of electric-only operation—as well as a "Battery Charge" mode that makes it unique among mass-market PHEVs in being able to restore its battery charge while driving (at a cost of lower gas mileage during that time). Recharge times otherwise were less than three hours on Level 2 (240V) or up to nine hours on 110V (household AC). Updates for the 2017 model year include a larger 7.0-inch touchscreen, Android Auto and Apple CarPlay, and a few new colors. 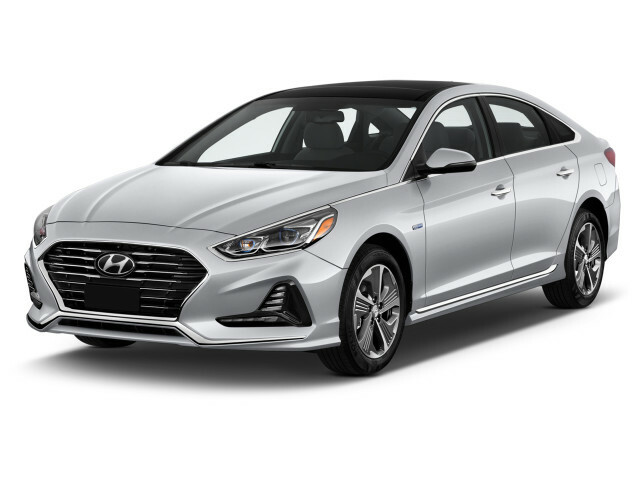 In 2018, a refreshed Sonata Hybrid was introduced that carried over the same powertrains, but with a new face and tail. When first introduced, the Sonata Hybrid showcased an all-new lithium polymer battery pack co-developed with LG Chem. 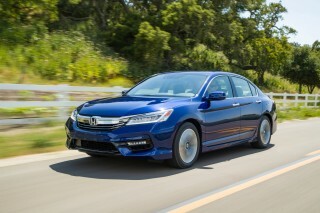 While the earlier Hybrid models provided reasonably good EPA fuel economy ratings (36 mpg city, 40 highway), their drivability wasn’t as smooth or responsive as their mechanical arrangement promised. 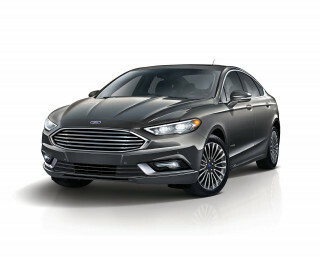 Instead of the complex planetary-gear power-split configurations that are employed by some other mid-size hybrids like the Fusion Hybrid and Camry Hybrid, the Sonata Hybrid has a so-called Transmission Mounted Electric Device hybrid architecture that uses a motor that spins with the transmission input shaft to provide boost during moderate or quick acceleration, regenerative braking when needed, and light acceleration and electric-only operation under some situations. 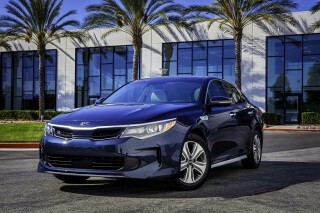 Other than that, Sonata Hybrid models of this generation very closely followed their gasoline-engine counterparts. As with all models in this generation, the exterior was bold and flamboyant, although the interior was more plain. Seats weren’t quite as good as some in this class, but this Sonata was a very roomy, comfortable-riding sedan overall. There was plenty of trunk space, too, although the placement of the battery in these early models prevented flat-folding seats. Very pleased with many intelligent features, quiet ride, great sound, and good EV range (beyond that posted so far). Hoping for many more years of satisfaction. Awesome vehicle for the money. Interior/Exterior: The front passenger seat appears to sit very low. The styling is acceptable but just a little flashy for my tastes. Comfort and Quality: For the Limited I was disappointed that the front passenger seat did not feature electric adjustment. The back seat amenities are sparse at best. Even considering the space required for the propulsion battery, the trunk is small compared to my previous and similarly sized car. The interior materials appear to be genuine quality but not genuine leather though that is what the seat covers are called. Safety: What can I say? The Sonata excels in safety and the ratings confirm that opinion. Features: It is very disappointing and inexcusable that the maps in the on- board navigation system were out-of-date by several editions. The cost to update appears to be between $169 and $200. I wish automobile manufacturers would simply install a Garmin GPS with lifetime map updates and traffic reports. The combined media, navigation system and backup monitor is not really intuitive but with experience gets easier. Don't get hypnotized by the various displays you can select on the little screen at center of the dash. Fascinating and most are useful. Fuel Economy / MPG: Excellent. On the inaugural 1602 mile drive from Seattle to San Diego, the car achieved just under 40 MPG. I couldn't believe it but confirmed the computers data manually. Reliability: TBD. However, my daughter has a 2011 Sonata and that car has been very reliable. LOVE THE CAR. JUST A FEW COMPLAINTS. love the car. you can't beat 37miles in the city and I average 42 on the highway.. Before my 2015 sonata hybrid I was driving a 07 DTS with all the bells and whistles, so when I tell you, I WAS TIMID ABOUT... love the car. you can't beat 37miles in the city and I average 42 on the highway.. Before my 2015 sonata hybrid I was driving a 07 DTS with all the bells and whistles, so when I tell you, I WAS TIMID ABOUT GETTING RID OF MY LAC,IT TOOK ABOUT 4DAYS AND 10 TEST DRIVES TO DO SO. PROS- design, gas mileage, camera, heated seats, interior believe it or not is very spacious for both front and rear passengers, trunk space is definitely good considering a lithium battery in the trunk for your hybrid. I was still able to fit a 12 inch sub, my ruck sack, and my back pack in the trunk. infinity sound system is NICE, gps/touch screen radio works very well, very little lagging, blue-tooth is on point!. Drove 80mph and people could hear me loud and clear, didn't know I was driving. The voice command works pretty good compared to the ones I tried in the BUICKS AND KIA. Over all the vehicle is put together very nice and everything works as it should, and it's quiet when you start the car. CONS- my gripe is the damn seats.. I love to drive, so being comfortable is major for me on my road trips. I'm used to BEING VERY COMFORTABLE ON LONG DRIVES. In the Hybrid my back starts to hurt 2 hours into the ride. Never had that issue in the lack. Seats feel too stiff, like your in a movie seat or something. They definitely cut corners on comfort section in the seats. NO VENTILATED STEATS... I WAS SOOOO CLOSE TO NOT GETTING THE CAR BECAUSE OF THIS.. YOU NEED VENILATED SEATS IN THE SOUTH, ESPECAILLY WHEN IT'S LEATHER!!!!. PISSES ME OFF EVERYTIME I SIT IN THE SEAT.. THE OPTIMA HAS VENTILATED ALONG WITH MY LAC, WHY DOESN'T THE SONATA. OPTIMA HAS BLIND SPOT WARNING. SONATA DOESN'T, OPTIMA HAS WIFI, SONATA DOESN'T... Other then that.. that's about it..
overall I like the vehicle.. only reason I got it is because I seen the savings at the pump.. AND they beat the offer I got from KIA. but difference from getting 13miles in the city to 37miles... If the sonata had the ventilated seats, with the blind spot warnings, wifi, with a little bit more comfort in the seats.. it would be the perfect car. p.s. if VENTILATED seats are important to you like it is to me, go with the Optima, the seats are a tad bit more comfortable in the optima but you don't get the space that you would in the sonata. You'll get a few more features for probably a grand or 2 more.. if it's not, then it'll be a win win.